We have finally finalized our lineup of artists for our mural installation project at Art Basel Miami this year. 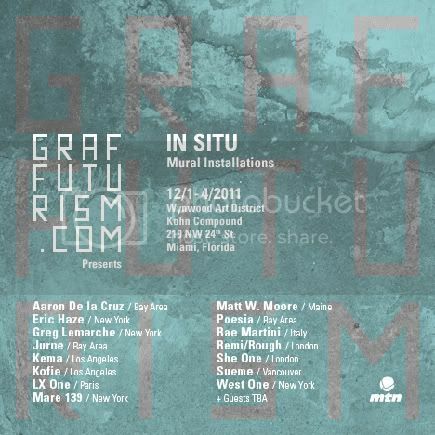 The installation titled “In Situ” will take place in the Wynwood Art District at the Kohn Compound during Art Basel Miami. The artists will include, Eric Haze, Mare 139, West One, Poesia, Aaron De la Cruz, Kema, Jurne, Sueme, Remi Rough, Greg Lamarche, She One, Rae Martini, LX One, Matt W. Moore, and Augustine Kofie. This project has been in the works for awhile now and we were lucky enough to secure the walls thanks to the Kohn Compound. Also a special thanks to MTN Colors for being our paint sponsor for this event. The project Titled ‘In Situ’ is a reference to the Mural installations that in the definition of the term, will be made and created for the site specific to this event. Permanent Murals that will be placed in a unique and contrary to traditional compositions. As graffiti enters its place among the art world as legitimate art form, we have put together this lineup with the intention of showcasing some of our cultures important figures. With most, if not all the artists having an extensive background in traditional graffiti we have tried to bring many aspects of our current culture. From Legends Like Mare 139 & Eric Haze to emerging stars like Sueme and Jurne. We have picked a wide spectrum of talent. International additions like Remi Rough and She One will also contribute, reminding us of how far our culture has reached. We offer a different vision, modernist at times to street art and traditional graffiti. The great part of the Art Basel event that spreads into the streets of the Wynwood arts district, is that all angles are represented from traditional graffiti, to street artists. We now add our version this year with ‘In Situ’. We hope you stop by and say hello. The graffiti Avante Garde as some have called it is here and we hope you enjoy what we will be bringing to the table this year. Also watch out for special guests that will be added to our lineup.